Ever since Uber left the roads of Singapore, commuters have considered this period a dark time in the local ride-hailing scene. It’s not healthy industry competition that we, as consumers, really care about, but the competitive prices that come with it. So it’s no surprise that all of Singapore awaited the entrance of Go-Jek eagerly, because in truth we’re actually cheering that the void of promo codes will be filled once again. Like you, we’re keeping a close lookout for all the discounts that Singapore’s newest ride-hailing firm is ready to offer. Here’s a list we have compiled. From the outset, Go-Jek offered priority to DBS users upon the launch of their beta app in Singapore. When you set up an account on the Go-Jek app, you’ll be prompted to key in a promo code to put you on the top of the waiting list if you’re a DBS or POSB card holder. The code is unique to your account, and you’ll have to type “DBS” followed by the first 6 digits of your American Express, Mastercard, or Visa DBS/POSB card. For example: “DBS012345”. Once you enter this code, you’ll receive two $5 vouchers that will be automatically applied to your first two Go-Car rides. This offer kind of nullifies the “special perks” for DBS/POSB members mentioned above, aside from the fact that they probably managed to get earlier access to Go-Jek and said vouchers. 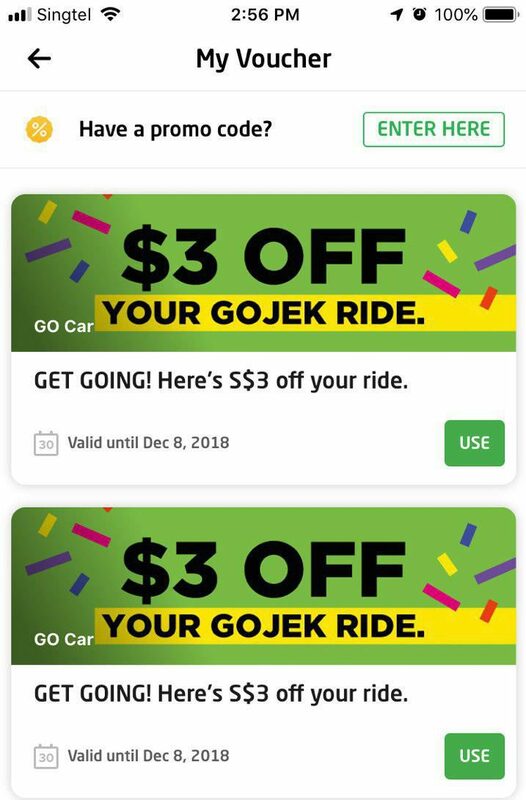 Now that Go-Jek’s service is fully extended across all of Singapore, all new users who sign up with the app will also be entitled to two $5 vouchers. As usual, the vouchers will be automatically applied when you book your first two Go-Car rides, and only stay valid for 14 days. If you’re still new to Go-Jek, now’s the perfect time to strike, as there are even more vouchers to be redeemed for a fixed period. 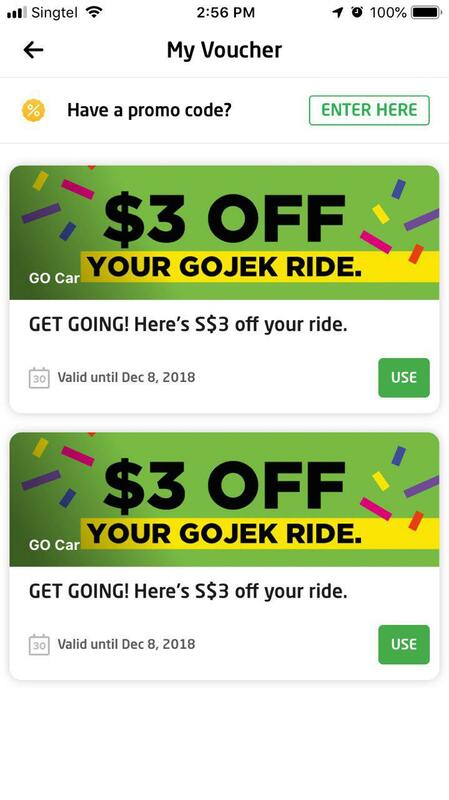 However, you’ll have to sign up specifically by clicking through a Go-Jek ad on Carousell’s app or website to unlock these discounts. Once you’ve done that, you’ll receive the usual two $5 vouchers for all new users, as well as another $13 on top of it. Sign up through Carousell between 24-31 January 2019, and you’ll also get an additional $3 voucher (that makes up $26 altogether!). If you miss that frame, you have all of February up till 6 March to sign up through Carousell, to still receive an additional $2 voucher instead. 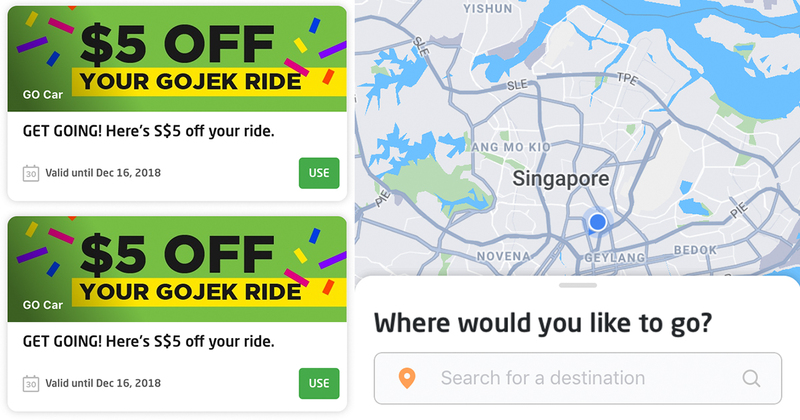 Within the first few days of operations, some beta users have already been receiving new vouchers pushed to them in the Go-Jek app. These vouchers don’t seem to require keying in any promo codes, so check “My Vouchers” in the app from time to time to see if you have been given a discount. We will be continually updating this list as more promo codes are released. Check back again for more!